This recipe can be found everywhere on the internet, including here. I did not bother with the streusel, as the dough looked tasty on its own, and it was. 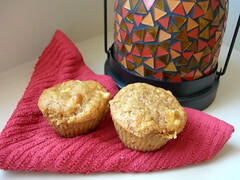 This is a great recipe this time of year, because you can dump in all your holiday baking remnants - I can't be the only one with half cans of pumpkin puree and random apples from buying them in bulk. I didn't have quite enough pumpkin so I just added that much applesauce, and it worked just fine. This recipe is my adaptation of the Pumpkin Cake II recipe found on Allrecipes.com (click here to see the original). Preheat oven to 350. Dump all ingredients in a bowl and mix well. Pour into desired pan and bake until done. For a bundt pan, I think it baked 50 minutes. I made a glaze of powdered sugar, vanilla, and milk. My co-workers raved about it and my students quickly devoured it as well. 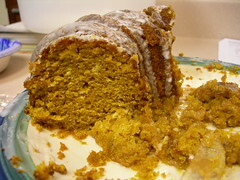 The cake was incredibly moist, and the spices really add a lot of flavor (as well as using the entire can of pumpkin and decreasing the water, which is what I did from the original recipe).